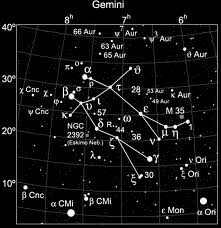 This picture shows the constellation Gemini with a better outline. You can tell that it looks like the constellation is two people holding hands. This is another picture of Gemini. It shows some latitude and longtitude lines. This image shows the basic outline of Gemini. Gemini is a constellation. 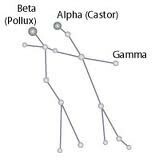 It is one of the 13 constellations in the Zodiac. Gemini's abbreviation is Gem, which is Latin for twins. This makes sense because the constellation is shaped as two twins holding hands. 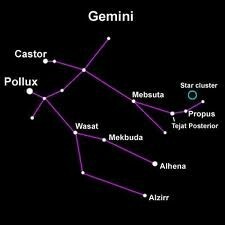 Castor and Pollux are the twins in the constellation Gemini. They are both brave and clever warriors. When one of the twins dies they make a deal with Zeus. They are then allowed to alter to immortality.They go on with their lives, but then they change places, over and over again. And each time they change they get to spend a little more time together, to exchange notes.